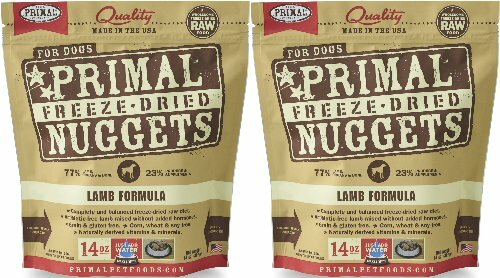 Produced using only the freshest, human-grade ingredients, Primal Freeze-Dried Nuggets Lamb Formula for Dogs 28oz (2 x 14oz) offer you the convenience and benefits of a well-balanced, safe and wholesome raw-food diet without having to grind, chop, measure or mix the ingredients yourself. All of the ingredients are procured from ranches and farms throughout the United States and New Zealand that take pride in producing wholesome raw foods through natural, sustainable agriculture. Carefully formulated to produce a nutritious, fresh-food diet that is easy for you to serve and delectable for pets to devour. If you have any questions about this product by Primal, contact us by completing and submitting the form below. If you are looking for a specif part number, please include it with your message.